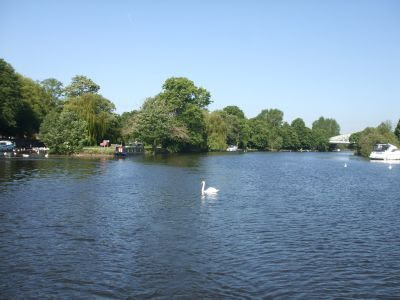 Today’s plan was (i) to get off reasonably early, (ii) get to Shepperton around lunchtime, and (iii) find somewhere to moor and chill for the afternoon. 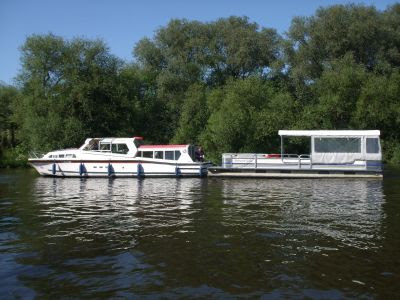 That leaves us just 2 locks and 10 miles for Monday to get to Teddington. i and ii went OK, it all went horribly wrong at iii. 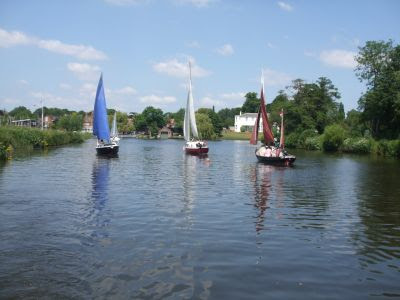 It was another bright sunny morning when we set off from Runnymede. 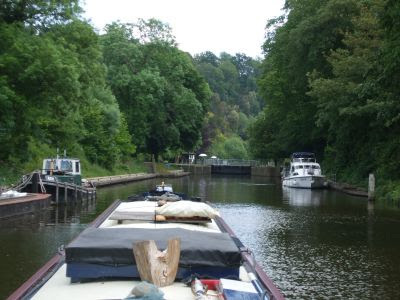 Bell Weir Lock was our first stop, and we shared it with another narrowboat. 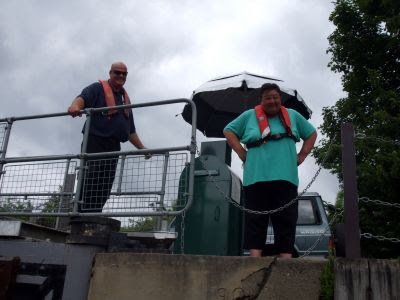 Arriving just before 09:00 meant the lock keeper did the work for us. 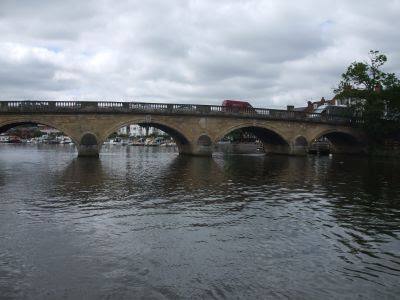 We were joined by the second team on the Thames Meander in punts. We met the first team on Friday the 22nd May. 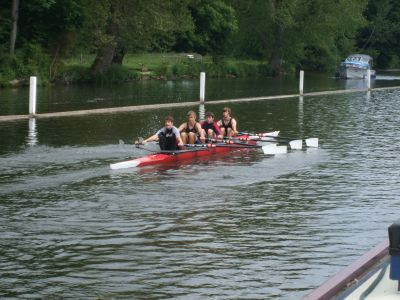 Over the 2 weekends they are heading to Shepperton. It’s tough on these lower stretches though, the poles are barely long enough. 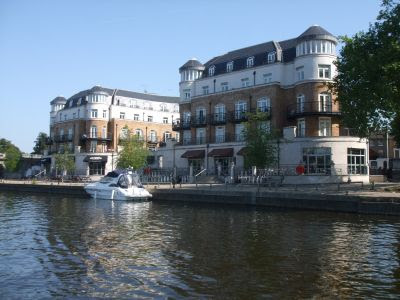 The river runs through Staines, with good moorings at several places, mainly on the north side. Moorings outside the Outback Steak House and The Slug and Lettuce Inn. Leaving Staines there are a couple of boatyards, and a big marina on the loop of Penton Hook. 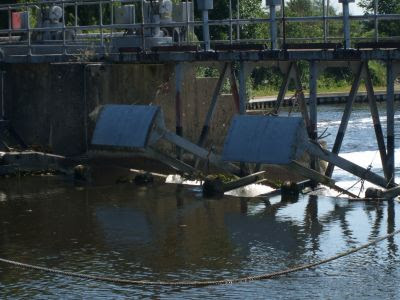 This loop is cut short by the lock cut, leaving an island. 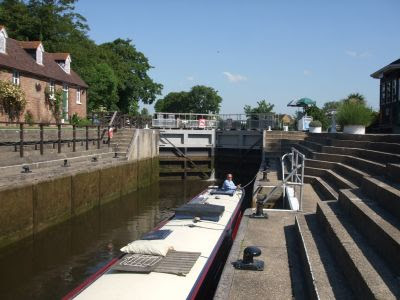 Chertsey Lock comes next, with a long weir to the right on the approach. Below the weir there are several moored boats, and I asked the lockie about how vulnerable they are in high water. “Very” was his reply. They shouldn’t actually be there, but the land is privately owned and it’s difficult to move them. 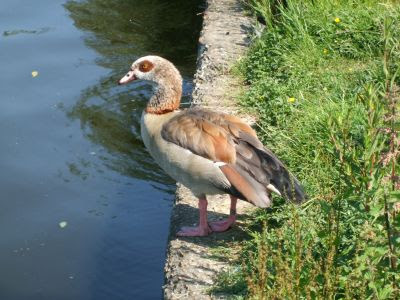 We took 20 minutes below the lock filling the water tank, supervised by this Egyptian Goose. 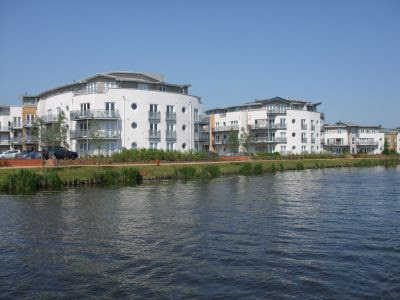 Just past Chertsey Bridge, there is a row of apartment blocks on the bank. 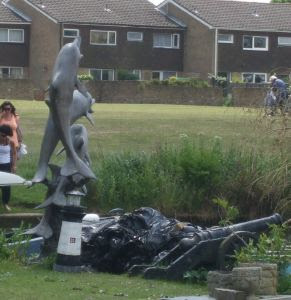 Somehow, I don’t think they blend with the river scene. In fact, Prince Charles’ “monstrous carbuncle” quote comes to mind…. Ugly apartments. The "porthole" windows are supposed to echo a nautical theme, I guess. It started to get really busy as we got to Shepperton Lock, but I wasn’t worried; we’d be moored soon, watching them all go by. Or at least that was the plan. Couldn’t see any suitable spots as we exited the lock, so we went off down Desborough Cut, the channel that cuts out the loop of the Old River around Desborough Island. Still nothing suitable, so we doubled back along the Old River. 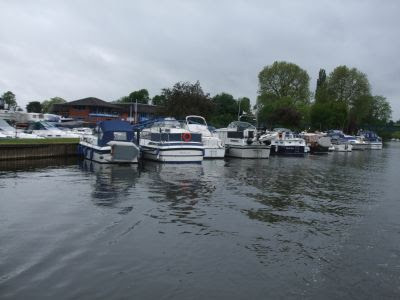 The only moorings on this stretch were overflowing, so after getting mixed up in a sailing race, we came back out again at the bottom of the lock. Mags managed to get a “Geese in a row” shot. 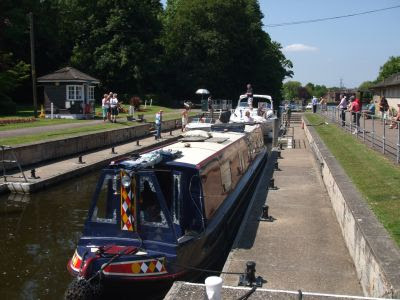 We made the decision to press on, through Sunbury, to have a look at a couple of possible sites shortly after the lock. 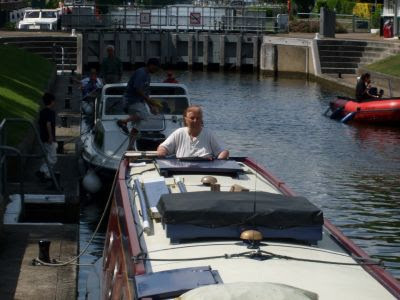 There was a long queue for the lock when we arrived, longer than the lock landing in fact, so there were a couple of craft milling about. I managed to get off with Meg and a long line, to hold Seyella into the bank as we edged towards the lock. 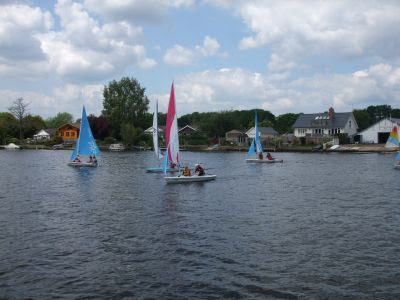 The lockie did very well, he managed to get 11 boats in at once. It didn’t help us though. Still couldn’t find anywhere to stop, so finished up at the next lock, Molesey. 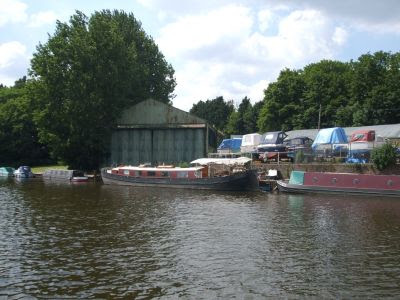 On the way we passed the boatyard on Platt’s Eyot. This was once the home of Thorneycroft’s, who built 170 motor torpedo boats here during WWII. 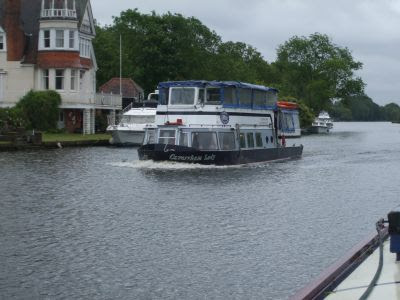 We dropped down Molesey Lock onto the very busy stretch alongside Hampton Court Palace. Hampton Court Palace from the river. 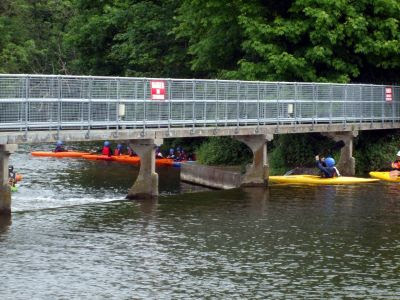 There are moorings not far downstream of the bridge, but they are always popular. So I was amazed to see a Seyella sized gap between 2 cruisers. I swung across the stream and headed in, drifting beautifully to a stop right in the gap. No more than a foot either end, the chap on the boat behind was holding his breath till I’d got lines ashore. So that’s it, moored in the shadow of one of the great houses of London, built in 1514 as a private residence by Cardinal Wolsey. After Wolsey’s fall from grace in 1529, Henry VIII took over the house, spending more time here than anywhere else. 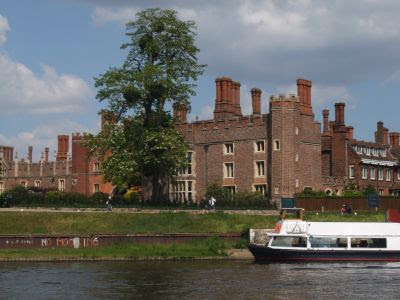 For more info on Hampton Court Palace, go here. Meg’s not so happy here. Passing boats are creating a lot of wash, making us sway and bounce. She’s more of a canal dog, where the water generally behaves itself better. It’s the smaller ones that make the most wash. The large trip boats hardly bother us at all. I've noticed that the Lock Keepers are not so inclined to chat as their counterparts further upstream. Much more businesslike, less casual. May be the weather, the volume of traffic, or having to work on a sunny Sunday. Still, there are worse jobs. A good time was had by all yesterday evening. A good chat with Dave and Barbara on Liberty Bell, over a bottle of wine, catching up on events of the last couple of years. The only annoyance was the evening strollers, peering in the windows. And, as it was such a nice evening, there were a lot of those. We weren’t disturbed overnight, though, and woke up to a clear blue morning. Moved off at just before 09:00, wanting to make sure we got a mooring spot near Runnymede. We’ll meet up with Dave and Barbara on Tuesday morning. 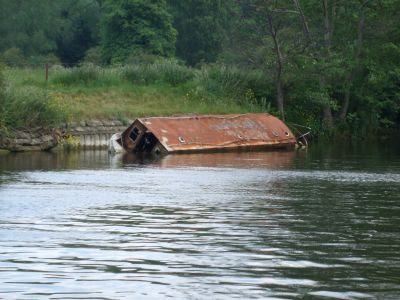 They’ve also arranged to go from Teddington to Brentford on that morning’s tide. 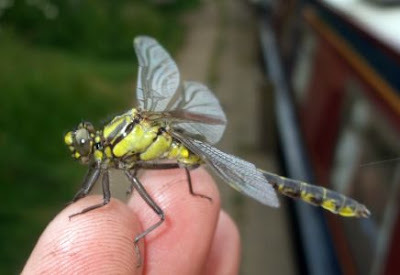 We first met them at Cromwell Lock on the Trent, waiting to chase the tide down that river. We had a gentle, uneventful cruise this morning. Fairly quiet, we had Romney and Old Windsor Locks to ourselves. 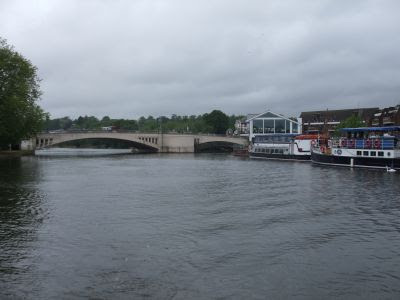 The river describes a long loop from a northerly direction to head south. Enclosed in the loop is Windsor Home Park, Crown land and not open to the public. 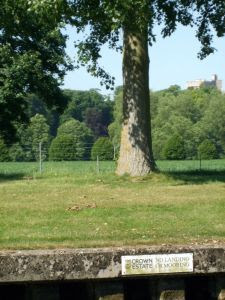 Clear message, Windsor Castle in the background. 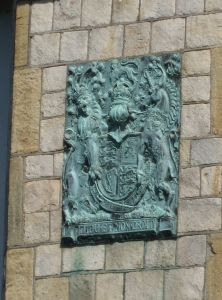 Alongside the park are Victoria and Albert Bridges, with the respective coats of arms mounted on the pillars. 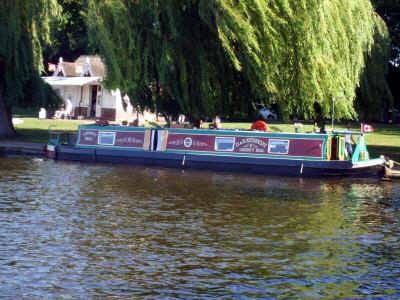 We moored on the bank almost opposite Magna Carta Island. 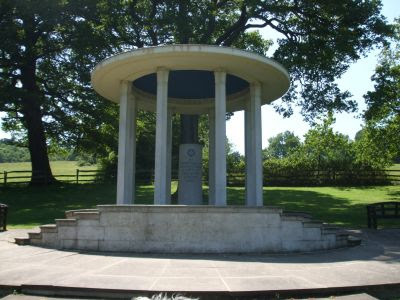 This is where, in 1215, King John was forced to sign the document that became the basis for English Law. It’s also the reason I wanted to stop here. I wanted to have a look at the 3 memorials in the area. 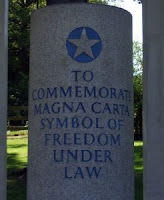 The Magna Carta, The Commonwealth Air Forces up on Cooper Hill, and John F Kennedy’s. Meg and I had a pleasant 2½ mile stroll, across fields and through woodland, visiting all 3. 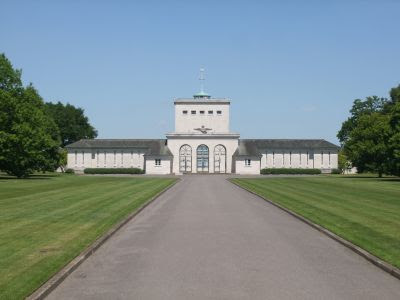 Unfortunately pooches aren’t allowed in to the Air Forces Memorial (except guide dogs, and Meg would never qualify on that score. Anyway, my camera would have been a bit of a give away…), so I had to be happy with a photo from the gate. This is a memorial to the over 20,000 airmen who where lost and whose remains were never recovered during WWII. We were luckier at the other 2 sites, no canine restrictions here. 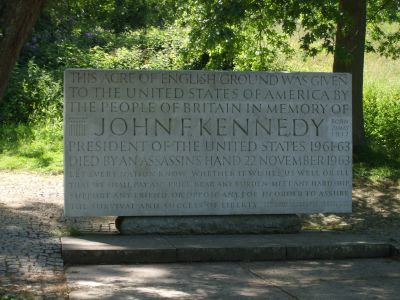 The John F Kennedy Memorial. 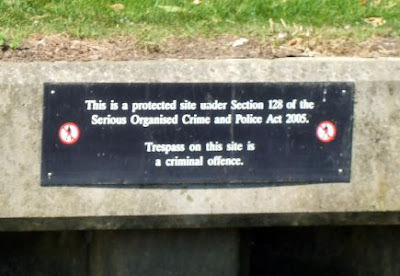 The acre of land on which this sits is officially US territory, formerly Crown land and granted by the Queen following his assassination. 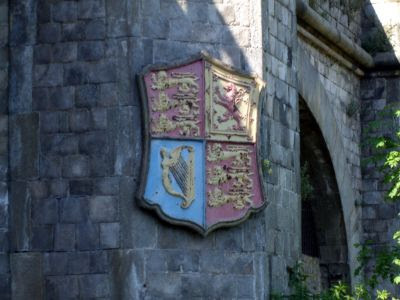 The whole area is administered by The National Trust. 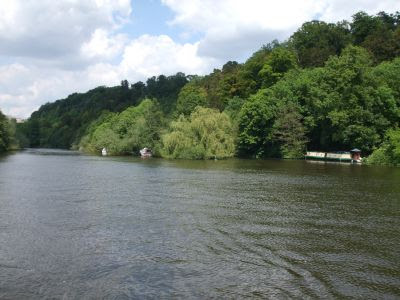 By the time I got back to the boat, the river was busy with boats of all shapes and sizes, the car park was full and the waterside was being enjoyed by lots of picnicers. One family group had a disappointing day though. 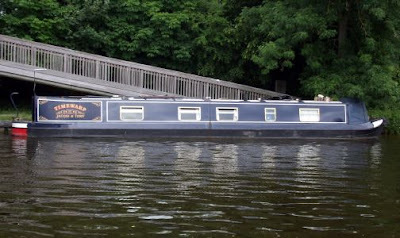 They’d hired a day boat, and had the bad luck of having an engine breakdown, just opposite us. A passing boat pulled them over to the bank, and a boat was sent out from the base to tow the disabled one back home. It’s been another great day, hot in the sun, cloudless blue skies, perfect weather to be out and about. Had a damsel fly come and visit yesterday evening. It was relaxed enough in the sunshine to be picked up. 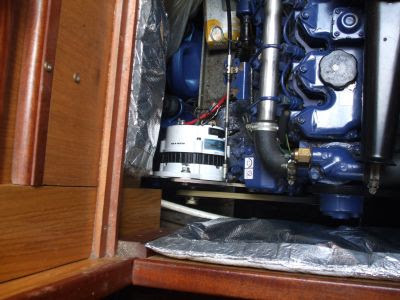 I was waiting on the lockside, chatting to Lawrence (Lockie) and Tony (NB Timewarp and Summer Assistant), when the new alternator arrived. Apart from some minor terminal differences, they were identical, so should have been a straight 1 for 1 swap. But when I mounted it the belt pulleys weren’t in line, so I had to adjust the shims behind the one on the alternator. New on left, old on right. After that it was straightforward, just bolting it on to the existing brackets. We got away at just before 13:00, the alternator kicking out a healthy 83 amps, for a start, steadily dropping off as the batteries charged. And no evil red light leering at me! And into the wooded gorge of Cliveden Deep. This is beautiful to cruise through on a warm spring day like today, the sun bringing out the different colours in the leaves. 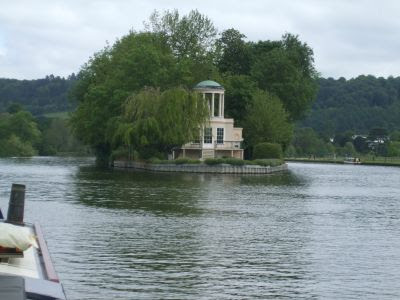 There are some islands in the channel at the south end, very popular as a picnic spot for boaters. 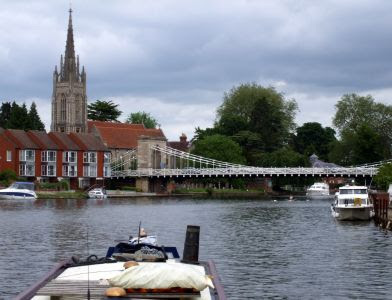 Maidenhead came and went without intruding too much, just the main road alongside Boulters Lock contrasting sharply with the previous couple of miles. Coming out of the town there are some pretty expensive looking properties on the west bank. 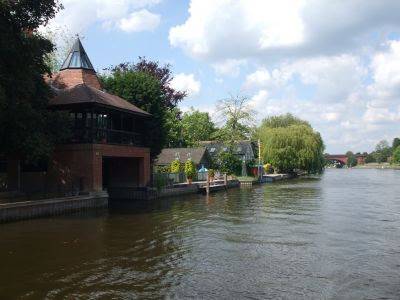 I reckon some of the boathouses are worth more than our last house! We arrived at Boveney Lock just behind a rowboat, the only craft waiting. 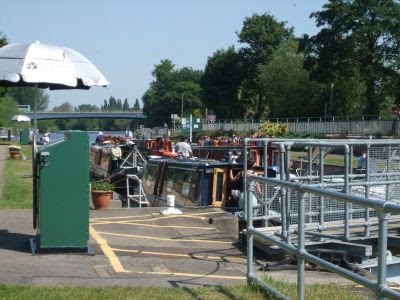 But by the time a lock full of boats had come up, there were another 5 boats plus a trip boat out of Windsor. 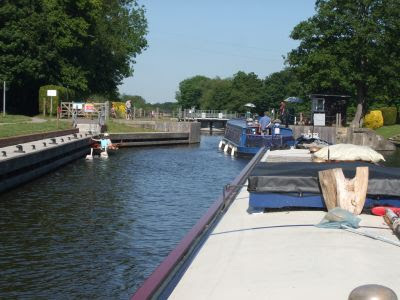 This is the busiest we’ve seen a lock in the whole trip so far. And an indication of things to come for the weekend, with fine weather forecast. The lockie managed to squeeze 7 of us in but the trip boat had to wait. There were another half dozen waiting to come up, so he was having a busy afternoon. This was the last lock of the day, the next mile couple of miles taking us into Windsor. 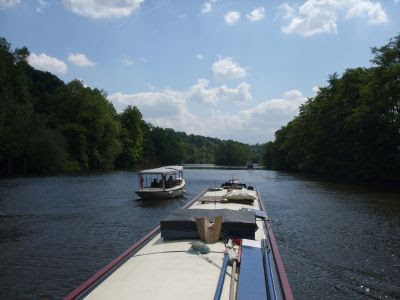 Not sure about the mooring situation, we pulled over on a spot just after the main road bridge on the edge of the town. I took Meg for a walk, and came across a boat I recognised. 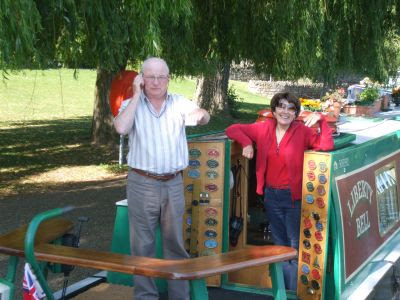 It was Dave and Barbara on NB Liberty Bell, last seen at Castleford were we parted company after doing the Trent and part of the South Yorkshire Navigations, way back in 2007. Never one to turn down the offer of the odd glass, and there being a boatshaped gap on the mooring behind them, we moved down the 10 minutes to pull in with them. 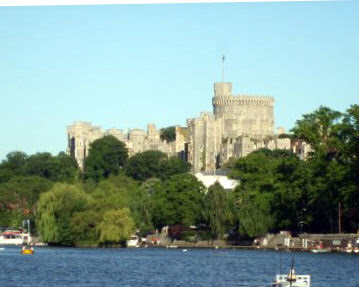 Coming around the corner, Windsor Castle comes into view. NB Liberty Bell. Dave was just off picture on the left, ready to fend off any other would-be moorers. A fraught couple of days. Yesterday was not a good day. First off, the weather broke, rain and wind moving in. It was quite cool too, so cool in fact I lit the fire! We left it till around 10:00 before getting away, hoping for an improvement. But it was a forlorn hope. So it was on with the jackets, and push off. 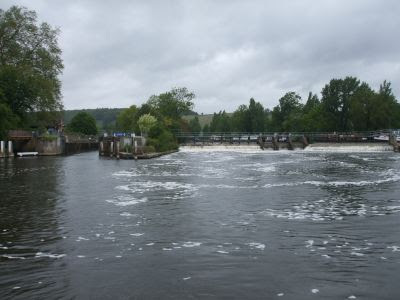 Mapledurham was the first lock of the day. The river is getting a lot wider now, and so are the weirs. 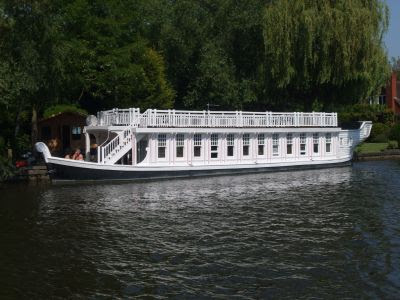 MV Caversham Lady, a river cruise boat out of Reading, came the other way, loaded with biddys on a day out. Pity it was so damp. I bet there was a lot of knitting done…. I’m still trying to come to terms with cruising the river through towns. 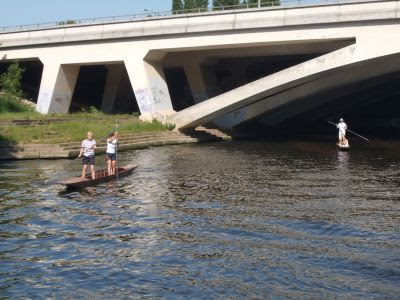 On a canal, everything stands on the banks, crowding as close as possible to the main transport route, as it was then. The towns down here stand a bit further back, giving the river a bit of elbow room in case it decides to flex it’s muscles. Lots more trip boats here, too. 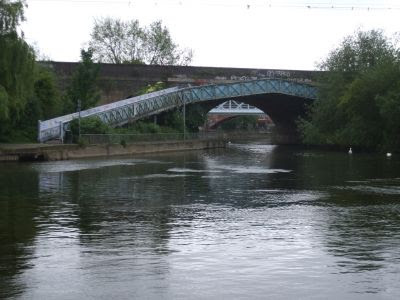 The Kennet and Avon Canal joins the Thames at Kennet Mouth, just on the edge of the town. This broad canal runs 100 miles to Avonmouth on the Severn at Bristol. It climbs up to the 15 mile long summit level near Pewsey in Wiltshire, before plummeting down 29 locks in just 2¼ miles at Devises. The bulk of these are the notorious Caen Hill flight. Coming out of Reading the rain started to ease a bit, so I pushed the hatch slide open. It was then I noticed that we had a charge warning light on. I checked the Mastervolt controller, and was relieved to see that we were still charging batteries, but was concerned about why the light should be on. I pulled over on the first available spot, and had a thorough check of the wiring and the batteries. Nothing seemed to be amiss, but the damned light was still lit. And the Sterling advanced charge controller had gone into fault mode, indicating that the alternator was delivering too high a voltage. Meter readings on the batteries and the output of the alternator showed normal levels, so I rang Sterling, thinking that it may be a fault with their unit. After several phone calls, checking various things in between, we came to the conclusion that the fault was with the alternator. It couldn’t be the Sterling unit; although it was wired to diagnose charging problems, the wire that actually encourages better charging (why it was fitted in the first place) had never even been connected! The alternator has to be modified to make this connection, and I guess it was just too much trouble. Score another one for Orchard Marina! So for the last 2¾ years I’ve been blissfully ignorant of the fact that I was getting no benefit at all from the unit I’d specified to be fitted. Anyhow, the diagnosis showed that we needed a new alternator. The voltage controller appears to have failed, and although the unit is still working, there’s a chance that it’ll cook the batteries if we let it. 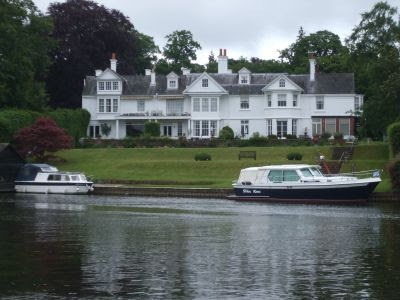 We pushed on keeping a close eye for any other anomalies, through Sonning and the beautiful Shiplake Lock, to moor opposite some fine houses at Lashbrook, just outside Wargrave. 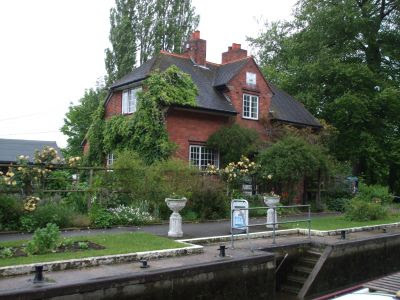 Shiplake Lock cottage and gardens. No other faults showed up, but I did notice that the battery voltage climbed to 14.3 volts, not excessive but higher than we normally achieve on engine charging. I had a good check again last evening, completely disconnecting the Sterling controller (it was doing nothing anyway) and could find no wiring faults. The earlier diagnosis seemed to be correct. I left the alternator on, as it was still working, then spent the rest of the evening trying to track down a replacement. As luck would have it, there’s an Isuzu Marine dealer at Reading, so I decided to give them a call first thing in the morning. There was also one on ebay (where else!) but the problem would be getting hold of it. It was only 5 miles and a couple of locks back to Reading, so that seemed the better option. After a pretty restless night, we were up, dog walked and waiting for 08:30 so I could ring the marina. Just after 9 I finally got through, only to be told that they only stock consumables like filters, not spares. And they wouldn’t be able to get an alternator for maybe a week. So that was Plan A out of the window. So it’ll be at Marlow by 13:00 tomorrow. We’d set off while all this was going on, heading towards Marlow. The day was a huge improvement on yesterday, warm with hazy sunshine from the start. 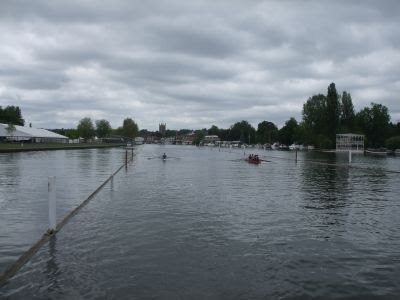 Henley was the first landfall, gearing up for the Regatta. Marquees and stands were being erected, the lanes were in position and the crews were out training. Singles, Pairs, Fours and Eights all buzzing about. They can shift as well. 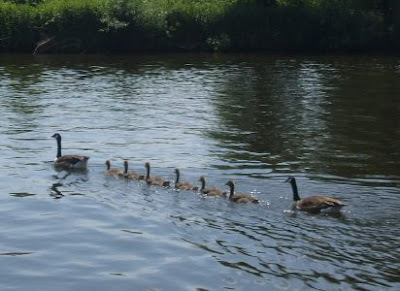 We were taking it easy, keeping an eye out for any of them doing anything silly, when a coxless four came up behind us, seemingly out of nowhere. They slowed as they passed us, getting their breath back. Temple Island marked the end of the 1¼ mile course, and the end of a lot of the small boat activity. 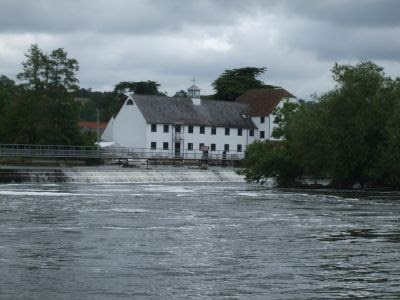 Just less than a mile further on is Hambleden Lock with it’s picturesque mill above the weir. Hurley was the next hive of activity, mostly land based this time. With a couple of static caravan sites on the south bank, the riverside is busy with strollers. 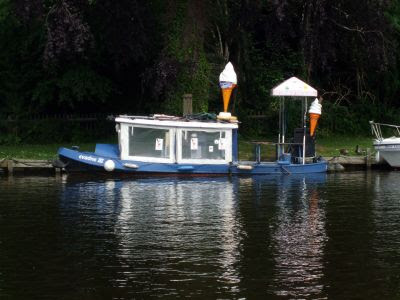 This chap gives a whole new meaning to “Ice Cream Float”! The small boats that were about were canoes, more interested in shooting the weirs than taking an interest in us. Shortly after Hurley is Temple Lock. Jacquie and Tony, from NB Timewarp, are helping out as Summer Assistants here and at Marlow. We usually meet tham around Fradley on the Trent and Mersey, so this is certainly a change of scenery! NB Timewarp, on Temple Lock island. Jacquie was on duty at Temple, and we had a quick chat while locking down. Tony’s helping out at Marlow, but was having a day off today so we didn’t see him when we arrived. We’ll catch up tomorrow. We pulled on to the visitor moorings below the lock for the night. 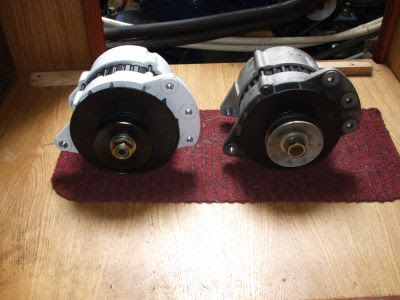 I stripped off the old alternator ready for the new one to go on when it arrives. While cruising today we’ve made a loaf of bread and done some washing. This has used power through the inverter, keeping the battery voltage down. Even so, it climbed to 14.5 volts at one point. 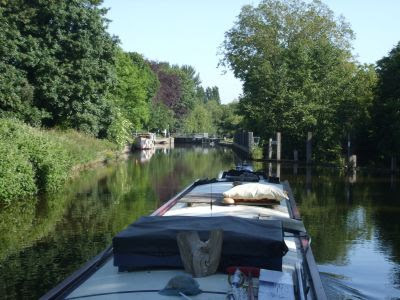 Over the last 2 days – Locks 9, miles 23. The lockside sign tells us it’s 58½ miles to London. That’s probably Limehouse. 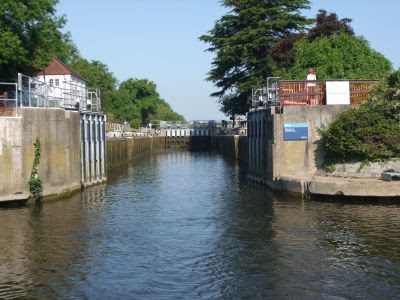 We’ve got about 35 to Teddington, with another 13 locks to do. A grey start, but a brighter finish. More boats and through some posh bits. What, moving on a Bank Holiday weekend? Another fine day, the last for a while? Watching the boats go by….